We are primarily a fellowship of churches; member churches can receive 501c3 coverage through our group exemption if they wish. They can also obtain ministerial credentials for their ministers as part of their membership. Individual ministers are also welcome to join, with the recommendation of an EFI member, and receive ministerial credentials (Christian Worker's certificate, License to minister, or Ordination). 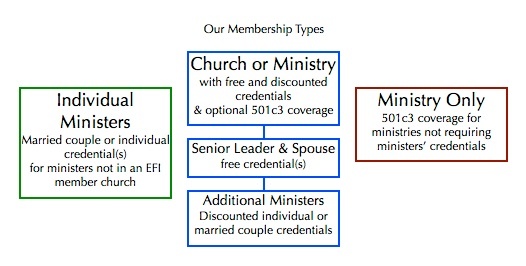 Para-church ministries seeking 501c3 covering (without ministerial credentials) are also welcome to join, with the recommendation of an EFI member or church. See the diagram below for an explanation of our membership types. Download our Membership Information Sheet or Apply online by clicking Join Us. Existing members can login to renew membership, view the member directory, and access "members only" resources.